One of the most popular cars in the history of the automobile industry has been the Ford Mustang. From it’s inception through to the present day it has been a symbol of American freedom and the open road. It has gone through a number of changes through the years, and each generation has had a large amount of young people clamor for a Ford Mustang of their own. The car has been made famous in real life, on television, in movies, and in many popular songs. The Ford Mustang may just well be one of the most famous cars in the world. 1. 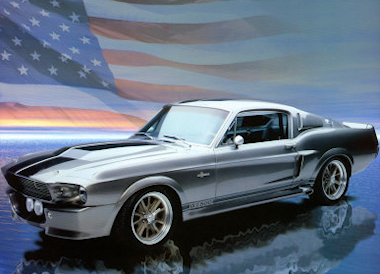 The Ford Mustang was first introduced to the American public in 1964 at the New York World’s Fair. it’s unveiling was covered by all three American television networks of the time. 2. The price of a new car was far different in the 1960’s than it is now. The suggested retail price for the new Mustang when it was introduced in 1964 was $2,368. 3. One of the people instrumental in the development and progress of the Ford Mustang was future Chrysler CEO Lee Iacocca. 4. The Mustang II, introduced in 1974, was based on the same platform used to build the Ford Pinto. 5. In its first year on the market, 1964, the Ford Mustang made an appearance in the James Bond movie Goldfinger. The Ford Mustang has legions of fans and creates more fans every year. The popularity of this quintiscential American car shows no sign of fading any time soon. The newest versions of the Mustang have stayed true to their history by taking on a body design that makes sometimes subtle allusions to the Mustangs of the past. The Ford Mustang is popular with those that wish to own and show off a car that has a good amount of power and also with those that simply wish to be seen driving one of America’s finest automobiles. Fans of the Ford Mustang are sure to be there each year when the newest model is released, waiting for the car of their dreams. Check out AmericanMuscle.com for all your Mustang Part needs.